St Edmund’s College is the oldest post-reformation Roman Catholic school in England. 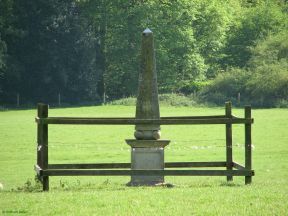 The obelisk, which was ‘intended as the gnomon of a sundial’, was erected, on its plinth on St Edmund’s day in November 2001. It carries a polished stainless steel tube through its centre, though which a viewer can look along the Meridian. It was designed by David Harber. The inscription (which is on a stainless steel plate on the south side), reads: ‘For the ancient faith. This sundial, placed on the actual meridian line by reference to which the time of the whole world is calculated, commemorates the passing of 2,000 years from the Incarnation of Our Lord and God, Jesus Christ, the Saviour of the World. Thanks be to God.’ The image sets from 2012 and earlier all contain a photograph of it. The obelisk was donated by the three Carey brothers, who attended the school between 1946 and 1965. Having been made aware when at the school that the Meridian ran across the grounds, they had always thought it worth marking, the impetus for action coming with the looming arrival of the new millennium. The specific site selected is interesting. Not only is it on the Meridian (0°0’0”), its latitude of 51°52’53” N is also easily memorable. How accurately it was placed though is another matter. For although advice had been sought and obtained from the United Kingdom Hydrographic Agency, it was eventually discarded in favour of taking simple sightings of the existing markings on the roads immediately to the north and the south. It had been intended that two additional plaques would be added to the obelisk, one with the triple zeros of its longitude on the north side and another with its latitude on either the east or the west. So far they have failed to materialise. So too have the planned stainless steel hour markers which were to be set into the ground along with markers for the summer and winter solstices, and the spring and autumn equinoxes. Although the markers for the solstices and equinoxes would have been straightforward to design, the direction of the shadow cast by the obelisk at any given hour will vary through the year requiring bespoke and highly complex hour marks to be made. By comparison, on a conventional sundial, the part that casts the shadow is not vertical as it is for the obelisk, but angled parallel to the Earth’s axis – an arrangement which ensures that for any given hour, the shadow will always fall in the same direction.